If you like to stuff blinking lights, elfs or Christmas trees into and around your house as soon as the Christmas season nears you might also like the desktop Christmas tree. Everyone else should probably better skip the article and head over to the next one. With Animated Christmas Tree for Desktop 2009 you get an assortment of eight animated (that means blinking) Christmas trees for your computer desktop. The Christmas trees require no installation and can be executed after unpacking them on the computer. They are always on top by default and can be moved freely around on the computer desktop. 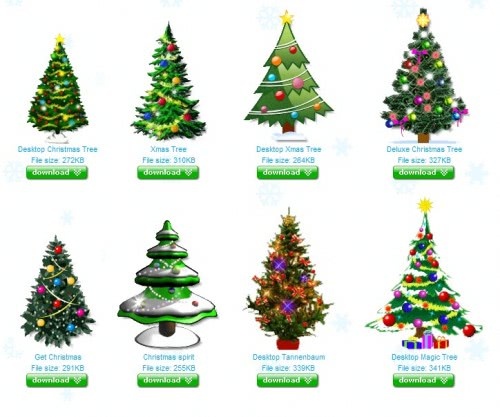 The choice ranges from smaller sized Christmas trees to deluxe and even magic trees. The transparency of the Christmas tree can be configured by right-clicking it. The same menu provides access to the always on top parameter. It is possible to launch copies of the same tree on the computer desktop or add another type of tree. It might be to much of a distraction for users working regularly with the computer but it might be just the right thing for children or users who work with it only occasionally. i reckon us linux users (Lusers) are SOL. bah, humbug. And that is the Christmas Trees that i am looking for and also i will like you to goahead and e-mail me back with the quotes of the Christmas Trees excluding shipping and the Method of Payments you do accept so that we can goahead and Proceed with this Order.Also if you do not have this order instock kindly email me what ever you do sale.Advice me with the method of payment that you do take and you contact details as well.May the God Lord richly bless you so much. well, a digital christmas tree will work for me. it will make my working hours brighter.